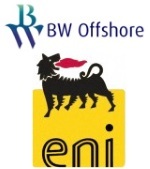 édité le 04/12/2015 - Plus de news de "BW Offshore" - Voir la fiche entreprise de "BW Offshore"
BW Offshore has signed a Letter of Intent for a two years extension for FPSO Abo with Nigerian Agip Exploration Limited, an affiliate of ENI S.p.A. until Q4 2016, with options for additional seven years (until Q4 2023). The company also operates additional 2 FPSOs. BW Offshore has a long track record on project execution and operations, as well as a robust balance sheet and strong financial capabilities. In more than 30 years of production, BW Offshore has executed 38 FPSO and FSO projects. The company is listed on the Oslo Stock Exchange. Eni is an integrated company that operates across the entire energy chain, employing some 78,000 people in 90 countries around the world. Scientific research and technological innovation are at the heart of its strategies for sustainable development. Eni’s excellent portfolio of conventional oil assets with competitive costs and the strong resource base with options for anticipated monetization ensure a robust value generation at Eni’s upstream activity. The vertical integration provided by the large presence in the gas and lng markets, and the know-how in refining and chemical sectors enable the company to capture synergies and catch joint opportunities and projects in the marketplace. Voir la fiche entreprise de "BW Offshore"
Les dernières news de "BW Offshore"